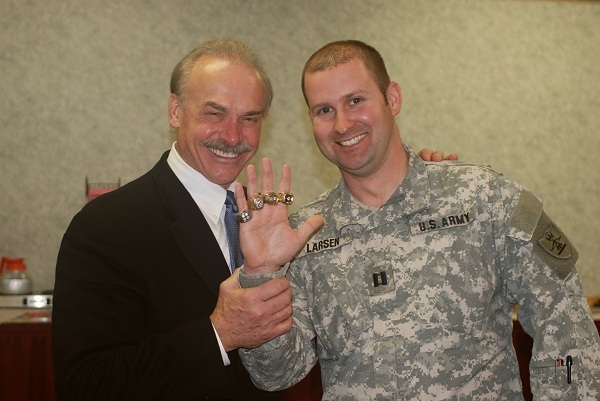 For Rocky Bleier, it is his actions off the field that define him. PSR's Joel Peretic recently had a chance to catch up with the Steelers great for an in-depth discussion about his career, his work with Vietnam Veterans, and his thoughts on the current state of the Steelers and the NFL in general. PSR: You played both football and basketball in high school; how did you decide to pursue football? Rocky: I played football, basketball, I ran track, and I played baseball. It was one of those periods of time when you played everything. You grew up with these guys that you went to high school with and you did all those things that were available; unlike today where everything is so focused and there is pressure on you. In high school we had a great coach who coached all of those sports. We had great success. We never lost a football game and actually I think we only lost four basketball games. So we were the number one team in both sports in the state of Wisconsin. Ultimately I knew where my strengths were, and that was in the world of football. Then I got a scholarship, so the focus then became on that sport. PSR: Were you a Packers fan growing up in Wisconsin, and did that influence you to play football? Rocky: Of course I was a Packers fan. I grew up around 25 miles outside of Green Bay. Lombardi came in 1958 and my first year of high school was in 1960. I went on to Notre Dame from 1964-1968. It was a part of living there and football being the focus of your life. You just became a fan. PSR: You won a national championship at Notre Dame in 1966. That gets overshadowed here in Pittsburgh. What was that experience like for you? Rocky: At that moment in time it was exciting to be a part of that team. There were no playoff games as you may remember; we were voted the number one team that year. You look at where you are and what you want to get accomplished. In high school, you want to win your division, but there were not playoffs like there are in Western Pennsylvania. So then you go to college. Whoever knew there would be an opportunity to do that? All of a sudden I’m playing on a team, and we win, and bam, you are on a national championship team. It was just another experience of playing. It established a sense of confidence in me that maybe I could play this game professionally. Maybe I could play this game at the next level. PSR: You were drafted in the 16th round of the 1968 draft. Did you really think you had a chance at making the team after being drafted that late? Rocky: It was an opportunity to come and see what took place. You don’t know what to expect. There was no reason to think I couldn’t play, but you have to catch the eye of someone. I came to Pittsburgh with my car packed so if I didn’t make the team I was going to head to Florida and spend a couple of weeks figuring out what to do with my life. I made the team playing special teams primarily. As the story goes, I played 11 of 14 games then i got drafted in Vietnam. The whole evolution of it is that you start to play in high school and you think if you can make the next level. Never in my mind did I think I was the star player on any level, nor did I have insecurities about being too small or too slow. You start to build some confidence. One level builds on another level and you think ‘hey, I can play with these guys’. Veterans come in and they were the same size so it’s a mindset you have to come in with that you believe and you can play this game. PSR: So you were drafted into the army? Rocky: Yeah I was drafted. It was one of those situations where your options were the reserves or the National Guard. I hadn’t planned that far. If you made a team you usually got into the National Guard. The circumstances were that I fell through the cracks and I got drafted. PSR: Ultimately you were wounded in both legs in Vietnam and you were told that you were never going to play football again. What was it like to hear that? Rocky: Well you didn’t want to accept that. Part of sports is that it’s a learned process. Football is a game of bumps and bruises but they ultimately heal and you go back in play. In college I tore a ligament in my left knee and lacerated my kidney and they healed. So when the doctor said he didn’t think I could go back and play, my thought process was that it would heal. It wasn’t as if I didn’t have a foot. I didn’t necessarily take it wholeheartedly. PSR: What brought you back to Pittsburgh to try the sport again? Rocky: It was the one thing I wanted to do. I really wanted to play this game. I didn’t think I was finished. This was my focus. I liked playing professional sports and I liked playing in Pittsburgh. Secondly, you needed to have an invitation and an opportunity. I got that from the Steeler family. The Chief sent me a postcard when I was in the army hospital that said ‘Rock, the team is not doing well. We need you.’ Now obviously, it was made of a good gesture. The team didn’t really need me. But what he created was a hope and an interest. So I did come back. They were kind enough they put me on injured reserve. I had another operation and I made the taxi squad the year after. It bought me two years to get bigger, stronger and heal. To show the difference. When you’re out of sight, you’re out of mind. It bought me the ability to hang around and they could see the improvement. I worked on all those things that were necessary and by 1972 I made the team. PSR: It took you two pretty tough years to get back. How often did you think of throwing in the towel? Rocky: I never thought of it. Only because the opportunity still existed. They paid me a salary, so I didn’t need a job. I didn’t have a family so I could be selfish and think of me. Sometimes you need that in your career. Each year I got a little bit better and was still hanging around. So it wasn’t like I thought it wasn’t worth it. It was all worth it. PSR: You do a lot of work with the Wounded Warriors now. Do you do that because you suffered injuries yourself in Vietnam? Rocky: I think there’s an identity. You do the things you like and the things you identify with. In this case with the Wounded Warriors—I being one—I understand what they go through. If it’s source of inspiration for them, then it’s something I can give back. They can identify with me in the fact that I did serve. No matter where you served or when you served, you served. No matter what branch you were in, you went through it. You understand what those experiences are. There is a bond there that maybe can be shared by only those who have gone through those experiences. Wounded Warriors became a special project in which I wanted to support and do what I can. PSR: You ended up winning four Super Bowls. Is there one that sticks out in your mind more than the others? Rocky: (laughs) Well we don’t have enough time to go through every one, but each one has their own importance. It was a sense of accomplishment to be on the team for the first one in Steelers history. That became important in that regard. Your contribution also becomes very important. We had a good running game and Franco became the MVP in that game. The second one was the Dallas game and we repeated so we became the third team in NFL to win back-to-back Super Bowls. Then, in 1978, we became the first team in NFL to win three Super Bowls. I scored a touchdown to give us the lead right before half on a broken play, and that play makes cover of Sports Illustrated, so that had a special meaning. The fourth one obviously was very important because we did it twice back-to-back and it put us in a different realm. Ultimately, when you look back, those teams go down as some of the best in history. PSR: In 1976 you and Franco Harris became just the second tandem to each rush for 1,000 yards. Franco is a Hall of Famer now and is one of the most recognizable athletes in Pittsburgh history. Were you ever bothered by the fact that he received a bulk of the attention even though you were quite a runner in your own right? Rocky: No, not at all. What works is understanding what your contribution to the organization or the team is. Mine was in that supporting role as a blocker for Franco. He had a wealth of talent. He was a great role model for us. He worked hard at his job to be very good. I wasn’t trying to compete with Franco. I had a hard enough time competing with myself. My role was important and I got recognized for my contribution and I think that is all we can ever ask for: to be recognized for your contribution and not to compete with others on your team. We were successful because Franco was successful and because Terry [Bradshaw] was successful throwing to Lynn Swann and John Stallworth. We all had roles. PSR: Fast-forward to the current NFL. There has been some sad news recently of Junior Seau committing suicide . Many suggest that there was a connection to the concussions he suffered as a player in the NFL. What do you make of the current concussion epidemic and the rules that the league has implemented to prevent them? Do you think they work? Or, do they make the league too soft? Rocky: I think the awareness factor is always important. The rules should be able to change. We understand that it’s a game of contact. It’s a game of risk. It’s one of potential injury. It’s part of the makeup of football. Two people running into each other is not a common practice, but it happens on the playing field. I think the more that can be done in understanding head injuries is a positive. That all trickles down to our high school and our junior high players. PSR: The New Orleans Saints made plenty of news for their bounty program. Did things like that exist when you were in the league? Rocky: No. Not that I heard of. There were tough teams. We were a tough team. Dallas and Oakland and Tennessee were as well. If you were going to be a strong, defensive team and you were going to be an intimidating team, then you had to play with that vigor. Now, that’s different than going out and trying to hurt someone. That’s not part of gamesmanship or sportsmanship and it’s not part of the game. PSR: Steelers linebacker James Harrison always seems to be a part of this conversation. How do you think he represents Steelers? Rocky: He plays within the realm of what the Steelers stand for. He is a physical, hard hitting guy. He didn’t sit around and say that he was going to take people out of the game or that he was going to intentionally hurt them like they did in New Orleans. He played the game the way he thought he was supposed to play and he was held up as part of the aura of being a Steeler. I don’t think he took cheap shots or intentionally went out and tried to hurt someone. PSR: How do you think Ben Roethlisberger represents the team? Rocky: He falls into the same realm. Part of his success is because of his size and ability to stand in the pocket and take licks. Now that changes. Now that he’s older he needs to be protected a little bit better. Maybe there will be some change, but he is the epitome of what Steeler players are about. PSR: What about Ben’s off the field reputation? Rocky: Well it’s part of growing up. He had to experience that it’s more than just one person that makes up a team and that what you represent lays a heavy mantle on your shoulders – especially in his role. Obviously as I fan I wasn’t pleased at his antics and how he represented the Steelers. But, we live in a country of second chances and we see what a person can do with a second chance and Ben seems to have made the change. PSR: Hines Ward just retired. Where do you think he ranks all time among those bevy of players? Rocky: I think he falls right in that category. He worked hard for what he achieved. He was a third or fourth wide receiver early in his career and was on verge of not making the team. He prevailed though, and he became the Hines Ward we know today. He fought. He scrapped. He caught everything. He played hard and hurt and he will go in Hall of Fame. PSR: You played for two of the most prestigious teams in history in Notre Dame and the Steelers. Which team did you like playing for more? Rocky: That is a difficult question because you play with different teams at different times. I enjoyed my experience at South Bend. We won and had success with a great group of guys but I was only there four years. I played with Pittsburgh for 12 years and I live here. That becomes the center of your life. It’s two different experiences. You can’t say which one is better than the other. That’s kind of a loaded question. PSR: Does something like earning a Purple Heart, as you did, transcend football and put everything in perspective? Rocky: Well that is one thing you don’t want to get. You don’t want a Purple Heart. I feel very strongly about the opportunity to serve. It’s not as if I enlisted, but having gone through that experience I understand what our young soldiers go through today. I’m very proud to have fought our country and been able serve with my brothers over in Vietnam.